Akachan – Ukuleles by Kawika, Inc.
Today we had the vet put Akachan to sleep. It was very difficult to make the decision, but we know it was the right one. She had lost a lot of weight, was mostly sleeping or just staring off into space, wasn’t eating her food and hardly even drinking water along with a list of other health issues. She was smiling and being a good sport, trying to please us until the very end, which came very quickly after the injection. We had nearly 13 years of her Shiba personality – lots of walks, tricks that only she could do, regarding most commands as optional if it wasn’t convenient for her and unconditional love for us. What more to ask for? About 25 years ago, my family and I lived in Northern Japan on the island of Hokkaido in the city of Hakodate. Within Hakodate we rented a house in the subsection of Yunokawa, named after the natural hot springs in the area. I was a kenkuin or researcher at Hokkaido University in the Faculty of Fisheries within the Chemistry Departments. I had a fellowship from the Japanese Government, Ministry of Education or Mombusho to study Marine Chemistry for a year as an exchange scientist. Our girls Lasar and Pei-lin were 3 and 5 years old at the time and because of the neighborhood being a mixture of city and rural styles, we were able to appreciate everyday Japanese living in a meaningful way. One of the things that caught my eye was the large dogs that pulled the two-wheeled small carts that old men used to haul recycled bottles and cans. Later I learned that these strong, loyal, patient dogs were part of a larger group of six different Japanese dog varieties. We returned to Hawaii and many years went by. Then in 1999 my wife Helen and I returned to Japan to visit friends and help to celebrate the 40th Anniversary of the Nippon Ukulele Association in Tokyo. At that time, we saw a number of much smaller sized dogs that looked like miniatures of the Hakodate dogs I had seen so long ago. We learned that they were called Shiba inu or Shiba ken. I was smitten. We were able to locate a breeder in Honolulu and in October of 1999 I brought my new puppy home to Hilo on the island of Hawaii. Here is a photo of 8 week old Akachan on her first night home (and my ugly feet). A tired little puppy but ready to settle into life in Hilo. It’s important for the reader to understand that I hadn’t had a dog in nearly 40 years. So there were so many things to learn about dogs per se, puppy behavior in general and Shiba puppy ways in particular. There were many anxious calls to the breeder and the veterinarian I can assure you. This page will chronicle Akachan’s life and times during the first year of her life at our house. I must say that I love her very much and that having her has added great richness to my life. In these pictures we see Akachan in her first crate. It’s pretty obviously hand-crafted out of 2″x4″ hardware screening and PVC pipe. Too deep for her to jump out of at the time and having a moving blanket pinned to the frame and side, it allowed me to be able to slide the crate around the house so that she could be with me when I was working or at night when we went to sleep. Her bed is a plastic tub (again from the hardware store) that we had earlier used for hanging wallpaper. Lined with toweling and one of my old shirts and having a couple of her toys, it seemed to suit her quite well. At 9 weeks Akachan is quite the playful young lady, and quite vocal in her requests for attention. I had not appreciated the term “Shiba scream” before hearing her disapproval of: visits to the vet, nail trimming, play where she lost the game, and so forth. We have persevered, however, and all that has diminished considerably. Lots of attention at this time to going outside immediately after waking up and meals, but Akachan was already nearly housebroken when she came home from the breeders. Well, it’s clear from the photo below that change has taken place and that Akachan is entering the “adolescent years”. Her ears are surely up to stay at this point. Exploring the backyard in a limited way (I hadn’t installed the chain link fence yet) gives her a great deal of pleasure. Although her color will continue to change, she is a little “sesame” girl for sure. There are three primary color variants in Shiba inu: red, black and sesame. The red is the most common, with black and sesame trailing fairly far behind. White Shiba inu also exist. The sesame color is a result of crossing the red and black color variants. It’s now mid-June and the fence is up. She is un-gainfully employed here with some poor invertebrate the object of her attention. She has never expressed a desired to dig under or around the fence and has become increasingly protective of her grounds when strangers pass by. At this point you can also see that her final colors are beginning to appear. Her little jodhpurs are well developed and her tail curl is there to stay. We’ve begun our morning walks beginning a month or so earlier, and I hadn’t realized how many cigarette butts there were around for a little dog to savor. My fingers spend nearly as much time in her mouth removing stuff as own tongue. Yuck! By July, she’s looking very “Shiba” as shown in this picture. A show dog, she’ll not be although her general bone structure and teeth are very good. For proper show status, her tail should be a little longer, that is, reach to the tip of her hocks when stretched downward. Her general coloration should be black-tipped red hairs for her back and sides, grading smoothly into reddish on the legs, rather than the red “racing stripe” down her back (which her grandparents also have). Her underside is also fawn color rather than the white desired by judges. The lack of these characteristics does not diminish my love for her, of course, although it does give me more insight into the Akachan’s genetic background and the capabilities of the breeder. For those of you who wish to learn more about the Shiba inu breed, there is a tremendous amount of information on the internet. A general search engine such as www.dogpile.com will easily yield many sites. One of my personal favorites is: http://village.infoweb.ne.jp/~fwie6394/ the website of Mr. Nobi Atsumi. 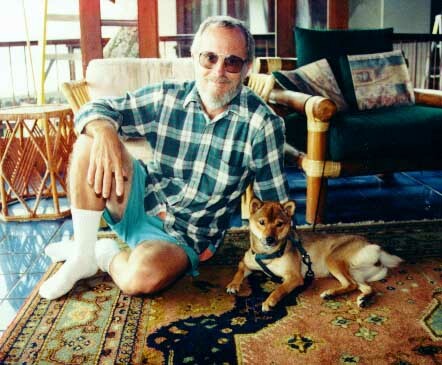 I had the opportunity to visit Mr. Atsumi at home (12/2000) and see his dogs. 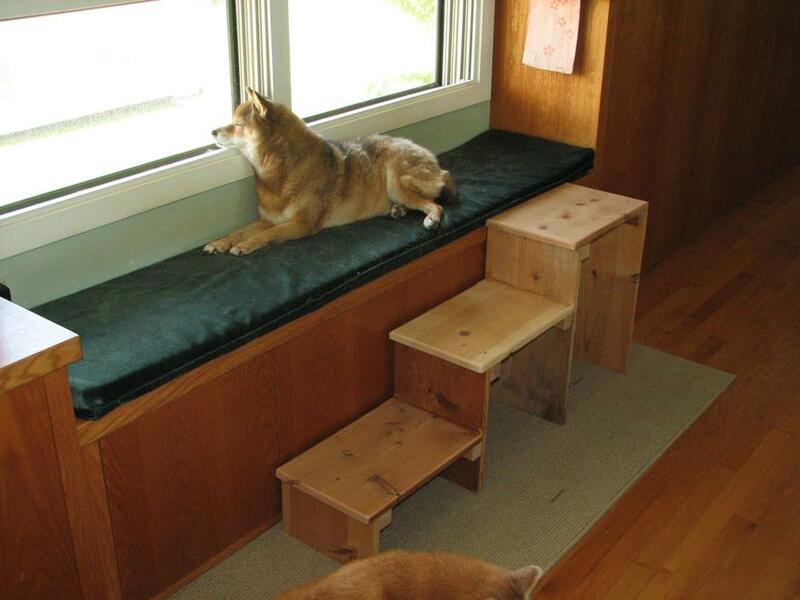 He is a true gentleman — thoughtful, intelligent and readily sharing of his considerable knowledge about the Shiba inu. I recommend the articles in his website for anyone wishing to get a deeper perspective on how the Japanese view what the Shiba inu should be. Links from his website will also head the viewer toward other sources of information.